An Arroyo Grande High School student who is battling a brain tumor has become a local celebrity after being kept out of his senior prom by the Lucia Mar school district. The community is now organizing a replacement prom for him. 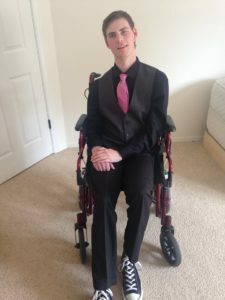 Lucia Mar officials stopped Jared Springer, 18, from going to prom, citing a district rule prohibiting students from attending extracurricular events if they are absent from school for a medical reason. The district informed Springer’s parents about the rule about 48 hours prior to Saturday’s prom. A district official said Springer could not attend prom unless he first received clearance from a doctor to return to school and his family met with district officials to discuss logistics. Springer had been absent from school because, about three weeks ago, he fell out of his wheelchair and broke his hip. Still, Springer’s nurses had cleared him to go to prom. Instead of attending the prom, Springer went with his date to dinner at the Madonna Inn. The prom took place down the street from the hotel restaurant. Media coverage of the Lucia Mar’s decision to ban Springer from his prom sparked outrage on the Central Coast. On Tuesday, the district held a press conference in which Superintendent Raynee Daley apologized for what she said was a communication mistake in her office that prevented Springer from going to prom. Community members responded by teaming up to organize a new prom for Springer. The effort is being spearheaded by Brighten a Corner Ministry. Springer’s new prom is scheduled for May 27 at the Mountainbrook Church in San Luis Obispo. All upperclassmen at Arroyo Grande, San Luis Obispo, Nipomo, Mission, New Tech and Coastal Christian high schools are eligible to attend. Dinner will be provided at the prom, and there will be an after-party in the church parking lot with food trucks. Springer has reportedly received offers from numerous girls who are seeking to be his prom date. Tickets to the event cost $5. Local students can purchase tickets through their schools. The prom organizers are accepting donations. Brighten a Corner Ministry can be contacted at (805) 215-2983. Awesome. AND he has a choice of girls to take as his date. I hope he has a great time and makes the most of a bad situation. The jack wagons in charge of Lucia Mar need to be fired, soonest. A new prom is not enough. Heads need to roll ASAP! Nothing more frustrating than rules put in place for a specific purpose and then administrators, who don’t know their arse from a hole in the ground, can’t figure out the difference between “spirit of the law” and “letter of the law”. The scary thing is that these administrators are the ones in charge of our kids’ education. No wonder this country is going down the drain! Well done central coast. I am glad the community came together to right this wrong. Standing ovation. But still it will be a hurtful reminder what has become of human virtue and humanity at large.